« Revolution in Egypt—the beginning of the end for the status quo? 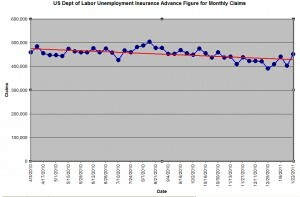 More Americans (454,000) than forecast filed first-time claims for unemployment insurance payments last week, indicating it that the labor market is not improving. How can it? With more people out of work, less consumer demand, and jobs being sent overseas, what does the government expect? And it’s not just the multinationals—USAID continues to export jobs. Microsoft’s chief of USAID, Rajiv Shah, has just set up computer training for 3,000 Sri Lankans. It is a safe guess that these 3,000 Sri Lankans will replace a lot of Microsoft employees, giving Bill Gates a (much needed?) cash boost. The number of people continuing to collect jobless benefits increased by 94,000 in the week ended Jan. 15 to 3.99 million. Economists forecast the number would increase to only(?) 3.87 million. 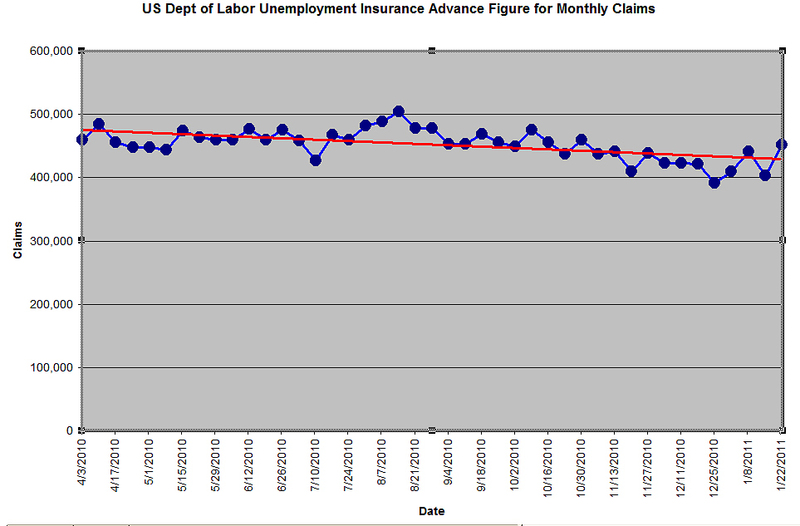 The continuing claims figure does not include the number of workers receiving extended benefits under federal programs. Those who’ve used up their traditional benefits and are now collecting emergency and extended payments decreased by about 98,000 to 4.62 million in the week ended Jan. 8. The U.S. Labor Department states falsely that the labor market gradually improved at the end of last year, because unemployment fell to 9.4 percent in December from 9.8 percent a month earlier, according to figures released Jan. 7. It fell only because a lot of unfortunate people used up their unemployment benefits. What the government is not telling you is that only those people receiving unemployment benefits are counted as being unemployed. The rest of us don’t count—that’s 14 million of us. But the good thing about USA is that despite the depressing labour statistics or even geting worse, nothing of the sort like what happened in Tunisia and now Egypt will happen here, right? The USA will remain a beacon of democracy for the whole world. And the US dollar will remain the international currency of choice, despite the trillion dollar budget deficit and FED quantitative easing from time to time. For Obama, the worst that could happen is that he may not be re-elected for a 2nd term. I think you are right. The people of a nation have to be poorer and with less to lose than the Americans or the Singaporeans before they revolt. Lee Kuan Yew can live to 200 and he will still be in charge of Singapore. The worst that Obama faces is an early retirement to a life of wealth.